When I began researching for this story, I initially had the intention to discuss Elizabeth Lewis' husband, Francis, who signed the Declaration of Independence. Then, the tale which follows caught my attention and I was absolutely captivated by it. Elizabeth Lewis, through bravery and kindness, demonstrates how a woman in a small village could still play a role in the Founding of America. Elizabeth Annelsey was 29 years old when she married. This age is slightly advanced for the time, but she patiently waited for the right man. That man was Welsh immigrant Francis Lewis, who had recently become business partners with her brother. They loved each other dearly, but Francis travel frequently. He was a merchant by trade which demanded many long trips across the sea. Additionally, while serving in the French and Indian War, he was captured and sent to France as a prisoner...for seven years. As they aged, Francis needed to travel less. The Lewis’ moved their family from New York City to Whitestone, Long Island where they lived peaceful lives. Francis was sent by his community to the Continental Congress in Philadelphia. Meanwhile, the might of the British Army gathered off the coast of New York. Francis signed the Declaration of Independence, knowing full well that Elizabeth was in the enemy’s sites. He was potentially signing her death warrant. The men who signed the Declaration of Independence knew they were committing treason. They knew they were putting their families lives, as well as their own, at risk. Many of us today might think ‘how could he do that to his wife?’ The truth is these Founders really believed that life was not worth living if liberty could not be preserved. Francis wasn’t doing this to Elizabeth. He was doing this for Elizabeth. But Elizabeth still bore the brunt of the redcoat’s anger. They bombarded the house, with cannon while she was still inside. A ball ripped a hole in the wall. A servant shouted to Elizabeth to run, but she stood her ground. The Brits stormed the house, ruining everything. One grabs the buckles off of Elizabeth’s shoes. He gets upset, noticing they were not real gold. “All that glitters is not gold,” she tells him. Elizabeth was brought to a prison in New York City. Her daughter, Anne, and grandchildren accompanied her. Elizabeth is the first wife of one of the rebellion's leaders to be captured. She is to be made an example of. Mrs. Lewis is given only the barest of essentials. Her clothes are ragged. Her food is worse. Her health suffers a great deal. Eventually, one of her servants finds a way to smuggle her some food and clothing. He was also able to communicate some of Elizabeth’s letters back to the Continental Army. George Washington found out about Elizabeth’s treatment, and he was not happy. He had his men take two prosperous Loyalist women from their homes. A letter is sent to the British asking if these women should be treated as harshly. Elizabeth is released, but is not permitted to leave New York City. She begins living with the servant who brought her food and clothes. He was an old man (I am unable to determine his name) and very sickly. He was a Roman Catholic who wanted the last rights, but no priests were in New York. Elizabeth was able to convince a priest in Philadelphia to travel north, break through the British lines, and return. The man died peacefully soon after. After eight months of captivity, Elizabeth was finally able to travel to Philadelphia where she met up with Francis. She was severely weakened but in good spirits. Now 64 years of age, her days of rebellion were over. Elizabeth’s son, Morgan, had married a daughter of Robert Livingston. They came down to Philadelphia where she met her daughter-in-law for the first time. Satisfied with the family she was to leave behind, Elizabeth passed away days later. 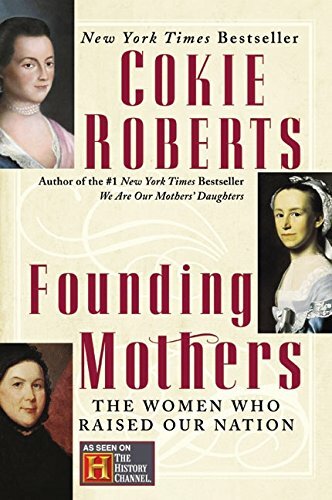 The best book on the women who Founded America is 'Founding Mothers' by Cokie Roberts. If you have not read it yet, I strongly recommend you do. Get it from your library or support the site by picking up a copy through the link below. You buy from Amazon, and we make a little commission, but your price remains the same.